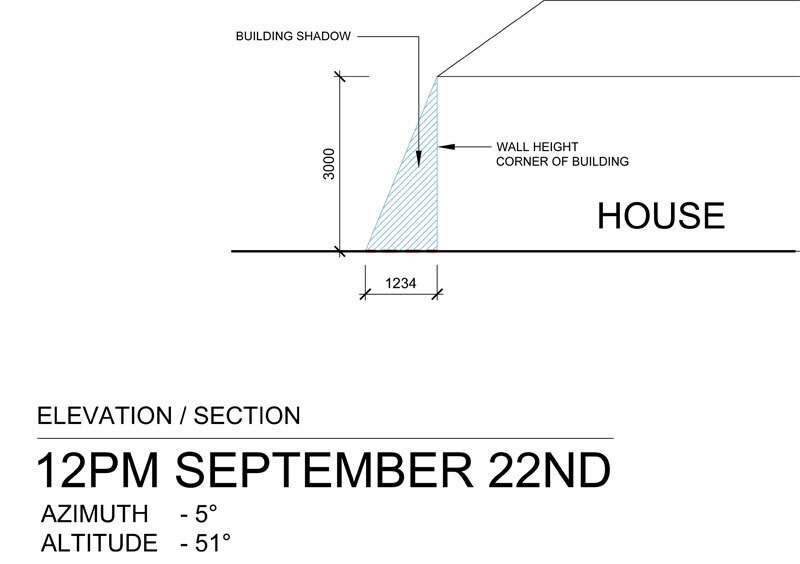 This tutorial will explain how to draw shadow diagrams in elevation or section view. 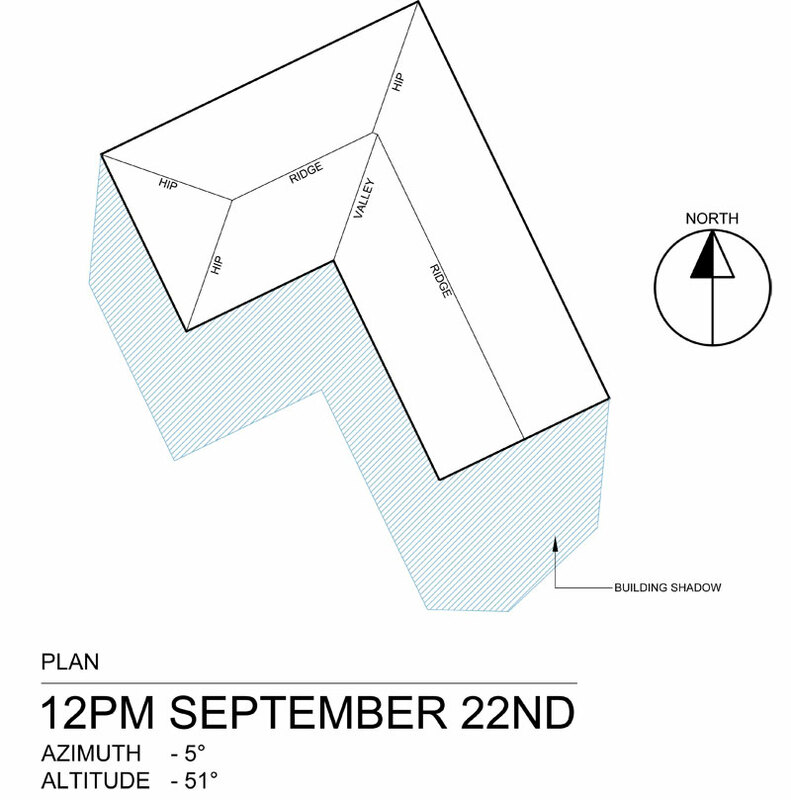 Shadow Diagrams are often just shown in plan view to see the potential overshadowing. May impact neighbouring properties. This type of shadow diagram sometimes does not give enough information to how high up a window the shadow will cast. At times councils request additional information to see how the shadow from the proposed building works will cast up a vertical surface on the neighbouring property, usually to see how the shadow may affect habitable room windows. 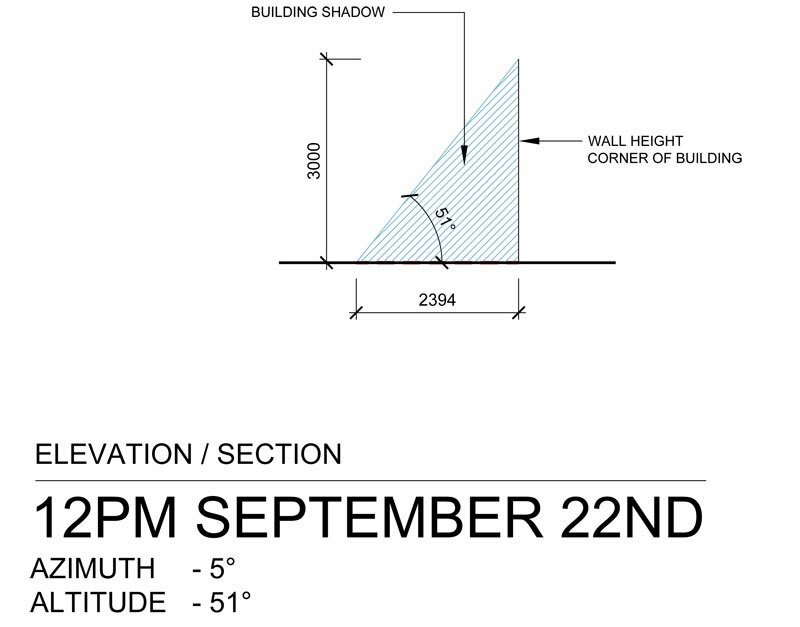 There is a lot of misunderstanding to how to prepare this type of shadow diagram in elevation / section view, as well as guides that are just completely incorrect. Figure 1 shows a roof plan of a basic house. The blue hatch is the shadow length that has already been calculated. To work that out using a calculator, the formula is: 3000 / tan(51) = 2394mm long shadow line. This is how many people work out the shadow in elevation and section shadow diagrams, but in most cases is not the correct method. Figure 3 is a side view / elevation of the shadow in the previous Fig.2 diagram. As I stated on the previous page...this is usually not the correct way to determine the angle of the shadow from the building to the neighbouring building. The problem with this approach is that we are intersecting the house on an angle, not perpendicular to the building, and in most cases the neighbouring building is square to the subject building. 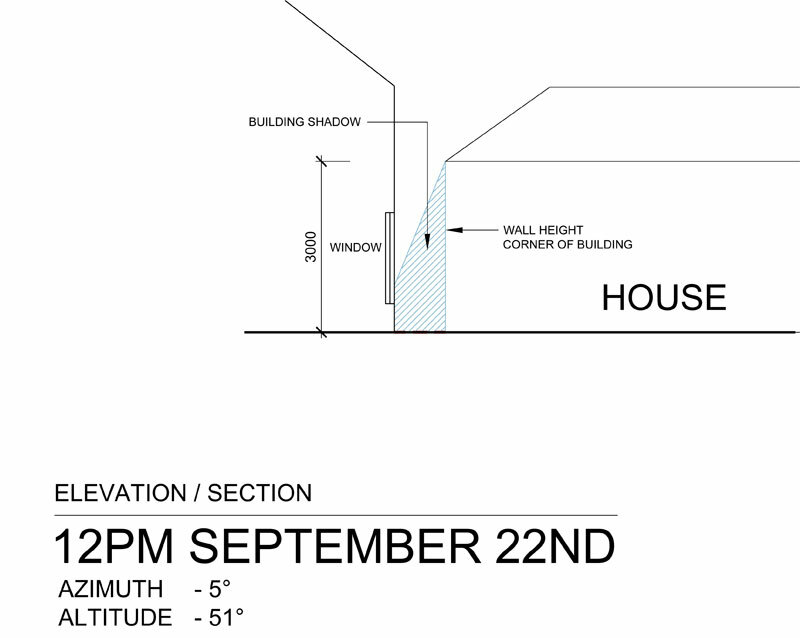 An elevation drawing is usually shown perpendicular to the wall you are facing. 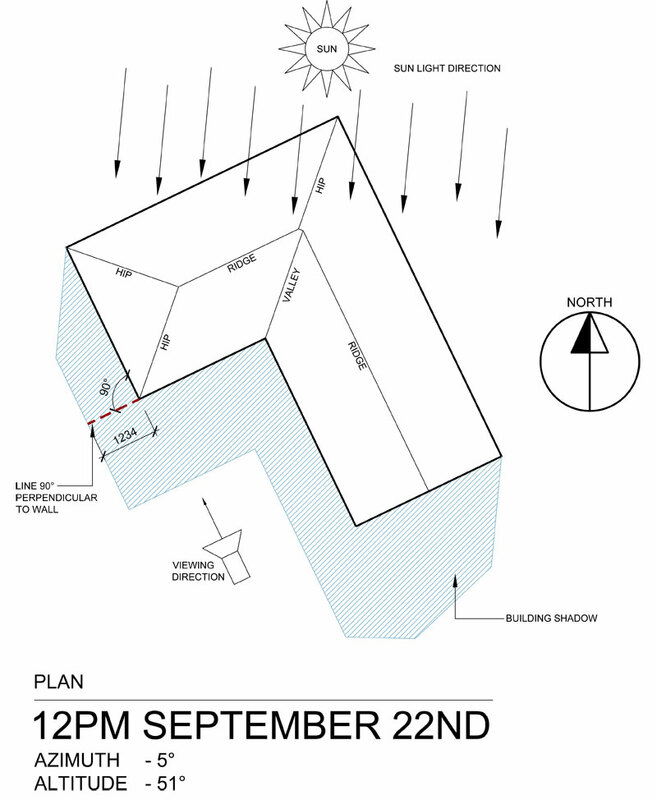 In the diagram above, the angle shown is not perpendicular to the house wall. The next figure (Fig.4), will illustrate this. In this diagram, a line is drawn perpendicular to the house wall (dashed red line). The reason for this is that we would be looking at this wall face on, just like an elevation drawing. Notice the viewing direction notated on the diagram. So to determine the angle of how the shadow falls at this section through the shadow and house, draw a line from the top of the wall (3000mm), down to the extent of the shadow line. The horizontal line of the shadow is 1234mm long. 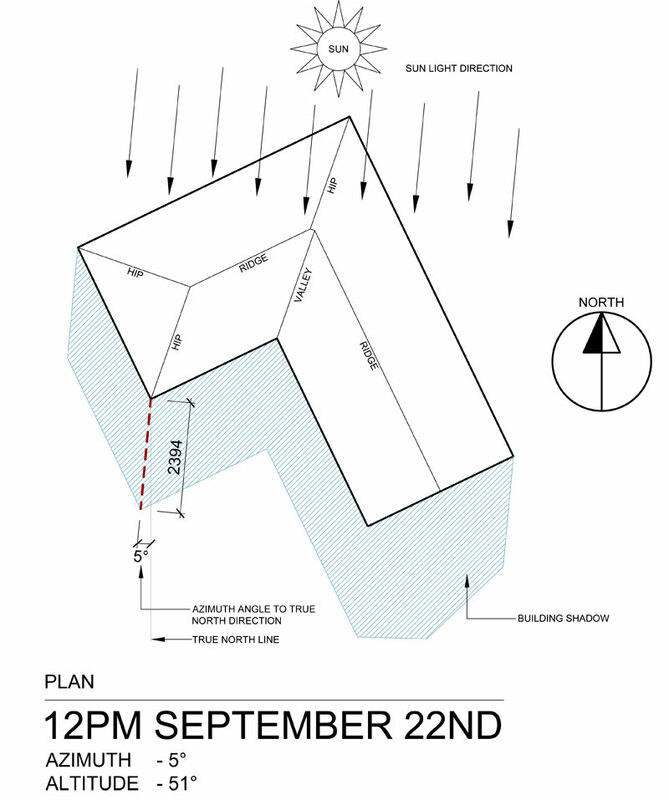 Using this method, the angle will always be different depending on the orientation of the building to true North. So in reality it isn’t feasible to have a chart showing the angle of the shadow for every circumstance. The azimuth and altitude of the sun are pretty much a constant (with minor variations over the years), but the method used above will change a lot depending on the orientation of the building. The next 2 diagrams show how this method works with a neighbouring building adjacent. 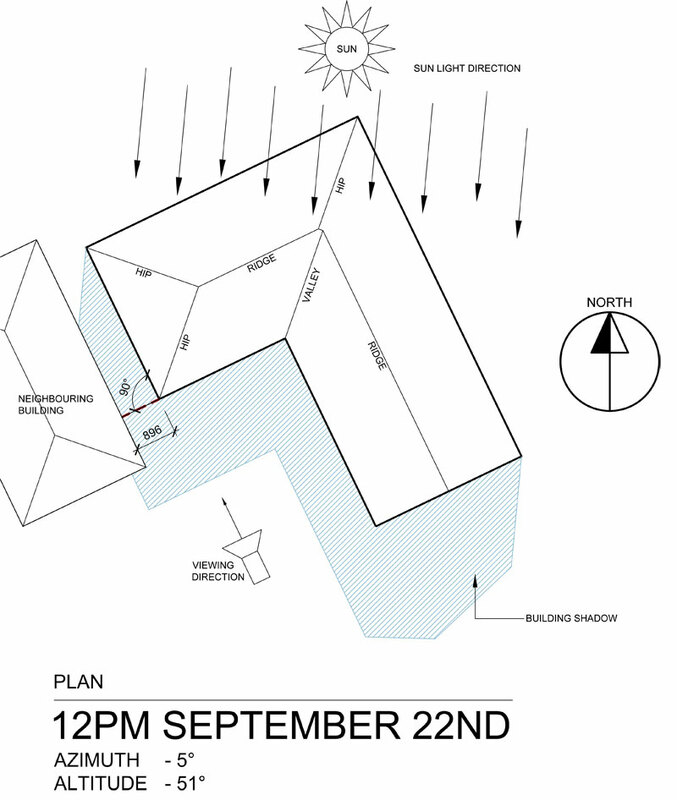 Figure 6 diagram above shows a neighbouring building to the West of the subject building. In most cases adjacent neighbouring buildings are perpendicular to the subject building. Figure 7 diagram shows how this method is used to demonstrate how the proposed shadow falls over a neighbouring window.